Brooklan Schoepp dribbles out of a double team during Fennimore's 53–52 SWAL victory at Cuba City last Thursday night. 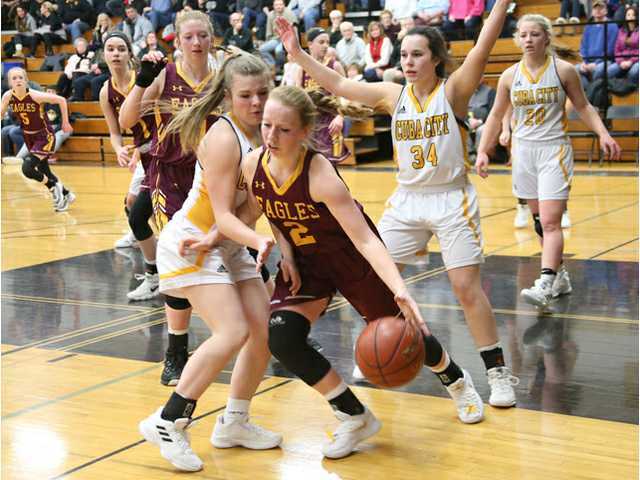 POSTED January 31, 2019 10:52 a.m.
FENNIMORE — The Fennimore girls basketball team scored the upset of the season in this part of the state Friday night. Coach Kevin Everson’s Golden Eagles defeated Cuba City on its own floor 53–52 in a Southwest Wisconsin Activities League game that knocked the Cubans out of a first-place tie. Fennimore improved to 5–10 overall and 2–7 in league play with the win, while the Cubans slipped to 11–4 and 7–2, falling a game back of Mineral Point (13–2, 8–1). The entire game was a back and forth affair with neither team able to build a commanding lead. Cuba City lead 22–21 at the half, and had built a 45–41 lead in the latter part of the second half. Fennimore senior Ashley Lang made a 3-pointer to cut lead to one at 45–44 with four minutes left. Sophomore Alexis Adkins converted a layup on a nice feed from Brooklan Schoepp to give the Eagles a 47-45 lead with 2:30 left. The Fennimore defense got a stop and turned it into instant offense on the ensuing possession when sophomore Claire Faulkner came up with a steal and threw an outlet pass to a streaking Brynlee Nelson for a breakaway layup and a four-point lead, 49–45. The Cubans scored on their next trip down court to again make it a one possession game. Schoepp was fouled on Fennimore’s ensuing possession and made 1 of 2 to push the Fennimore lead to 50–47. Faulkner tipped a Cuba City pass and Fennimore nearly came up with another steal, but the loose ball found its way to Kiera Holzemer, who laid it in with less than a minute to play. Courtney Busch stole the ball moments later and the Cubans had a chance to regain the lead, but Adkins blocked Elizabeth Misky’s baseline runner and got the ball to Nelson. Nelson was immediately fouled and made two clutch free throws with 25 seconds left to make it 52–49. Cuba City coach Jeff Pustinca called his last timeout, and set up a potential game-tying 3-point look for Jenna Droessler, but it missed the mark. Adkins corralled the rebound and was fouled with 10 seconds remaining. She missed the first, but made the pressure-packed second to make it a two-possession game. Misky hit a 3-pointer off a high-ball scree with four seconds left to account for the final score, but with Cuba City out of time outs, Fennimore never had to inbound the ball and held on for the thrilling victory over the league’s premier program. Adkins finished with a game-high 16 points on 6 of 8 shooting, seven rebounds and four blocks. Faulkner had 15 points and five rebounds, and Nelson added 14 points, six assists, five rebounds and three steals. Lang chipped in five points and two rebounds. Schoepp had one point, six rebounds and three assists and Mariah Kopp added two points. Fennimore will host Darlington (12–3, 7–2) tonight at 7:30 p.m. before hosting Boscobel (6–9, 3–6) on Monday night. The Golden Eagles will travel to league-leading Mineral Point (13–3, 8–1) on Tuesday night. Fennimore (5–10, 2–7) — Alexis Adkins 16, Brooklan Schoepp 1, Brynlee Nelson 14, Mariah Kopp 2, Claire Faulkner 15, Ashley lang 5. Totals – 20-41 10-17 53. Cuba City (11–4, 7–2) — Jenna Droessler 3, Elizabeth Misky 11, Courtney Busch 6, Kiera Holzemer 15, Sophia Sanger 12, Mckenzie Calvert 2, Madison Calvert 3. Totals – 19-57 9-17 52. 3-point goals — F: 3 (Faulkner 2, Lang 1), CC: 5 (Droessler 1, Misky 1, Busch 1, Sanger 2). Total fouls — F: n/a, CC: n/a. Fouled out — none.